Instead of focusing on a whole movie or series of movies I’ll be focusing this post on the one, the only, Captain Jack Sparrow, savvy? I love how Johnny Depp portrays Captain Jack. 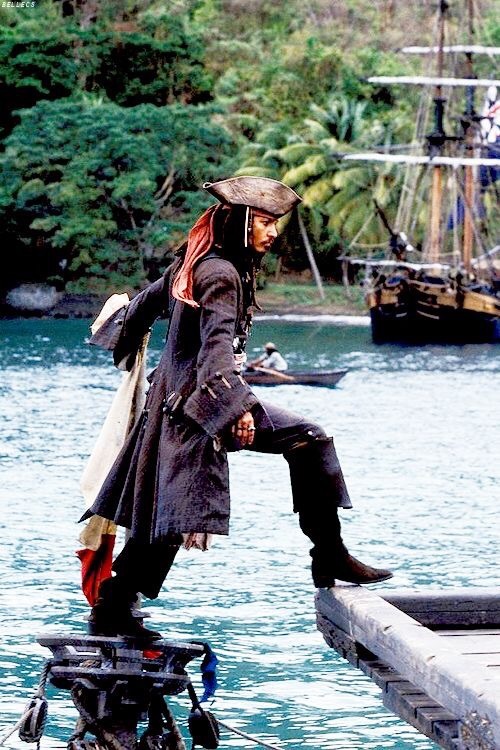 The slightly drunken and unbalanced way that he moves and the slurred accent help create the believability needed for Pirates of the Carribbean. As much as he wont admit it Capt. Jack does have feelings and he does care for people, meaning he’s not completely selfish. I will concede that his usual behavior is self-serving but he does have ska soft side (that I love 😉). Most people I talk to that have a love for pirates love them because of Capt. Jack Sparrow (aka Johnny Depp). He basically make the dirty, scummy job of pirating look desirable and fun. Obviously we know that we can’t be actual pirates, (but we can pretend at ren faires) but it does open up a world that we would otherwise be uninformed about.